Each element on the image is a link to the corresponding Help section. A favicon is a site icon next to the title of the found document. For information about the requirements for favicons and how to add them to a website, see the Help for Yandex.Webmaster. The title is a link to the found document that opens on the same tab or a new tab (depending on the settings). For information about how a title is generated in search results and whether you can change it for your site, see the Help for Yandex.Webmaster. The address is a link to the found document that opens in the same window or a new window (depending on the settings). The address can be a navigation chain from the root to the current page. You can go to any of the sections by clicking on the corresponding link in the chain. By clicking the button next to the document address, you can go to a cached copy of the page, view all the documents found by your query on this site, or report search results. If the original document is not available or Yandex deems it potentially dangerous, you can view the last cached copy of this document. To do this, click the Cached copy link . To highlight the query words in a cached copy, enable the select query words option in the top menu of the page. With the and arrows next to the query text, you can navigate through the words found on the page. The Show more from the site link allows you to browse other site documents that match the query. You can also set restrictions on searching the site in the settings. Doesn't match the search query. Shocking or unpleasant information: images and text that have upsetting content (such as accident victims, violence, or extreme physical abnormalities). Search spam, i.e., pages whose owners try to fraudulently move them higher in the search results. You can report a single found document or the entire page of the search results. After verification, your feedback will be taken into account by the Search automatic algorithms to improve the quality of Yandex's search results. A brief summary of the document is formed from the text, then sentences or phrases with the words specified in the query are selected. 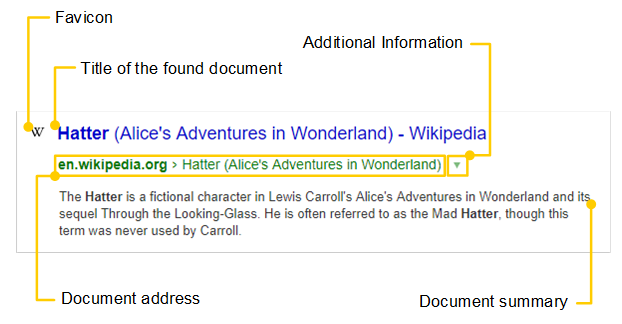 If the summary displays the phrase “Links to this page contain”, this means that the found document does not contain the words of the search query, but they are present in the text of links to this document from various internet resources. Note that the site summary is not static: it changes depending on the user's search query. For more information, see the Help for Yandex.Webmaster. With sitelinks, you can go to the site section you need directly from the search results page. Sitelinks are generated automatically by the Yandex robot. See the Help for Yandex.Webmaster for information about what you need to create sitelinks for your site and whether they can be modified. With extended information about the document found, you can find out the address and working hours of a business, the date of the last page change, the document format, and so on. For more information, see the Help for Yandex.Webmaster.